Jinkee Pacquiao, wife of Filipino boxing champ Manny Pacquiao, has allegedly caught a girl sending an "indecent proposal" to her husband. The Sarangani vice governor identified her as Nikky Sotto or Dennise Garcia, believed to be one and the same person. Nikky/Dennise purportedly asked Manny to go to Marikina or have her fetched and meet her at a hotel. She allegedly told the solon not to worry about his wife as everything will be kept secret. While Jinkee did not specify, it is believed that the person has been sending what she called "indecent proposal" via Facebook's private messaging (PM) feature. 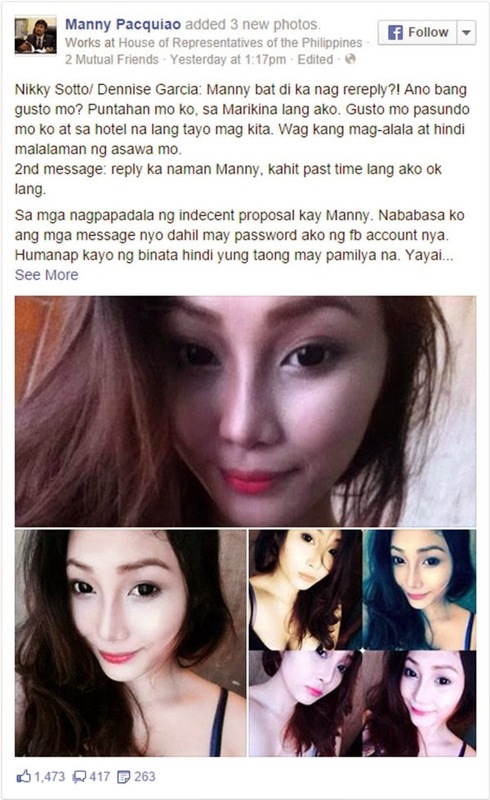 In her alleged message, the girl said it will be fine even if she will only be Manny's "pastime." In a written response, Jinkee claimed that she can read the messages of those who are sending indecent proposals to Manny because she knows the password of his Facebook account. The public official advised them to look for somebody who is single and not someone who already has a family. Jinkee asked why there are women who fall for married men and couldn't care less if they destroy families. The vice gov said she hopes God will guide the girl to the right path. She then issued a warning and told her to have dignity and self respect. Jinkee's post garnered thousands of likes and a few hundreds of shares as of this posting. We encourage our readers to take its content with a grain of salt because we noticed that the Facebook page looks suspicious and is unverified. The so-called indecent proposal could be a publicity stunt or hoax.